In the Oldene Dayes, Christians were being persecuted, so they hid in caves. A woman named Lucia risked her life to bring them food. In order to keep her arms free for carrying supplies, she put candles on a wreath and wore it like a crown on her head. That way she didn’t have to haul around a lantern, although she did increase the risk of setting her hair on fire. I like this story a lot; there’s a lot of delicious allegorical potential going on there. No lie: Eleanor was almost named Lucia. 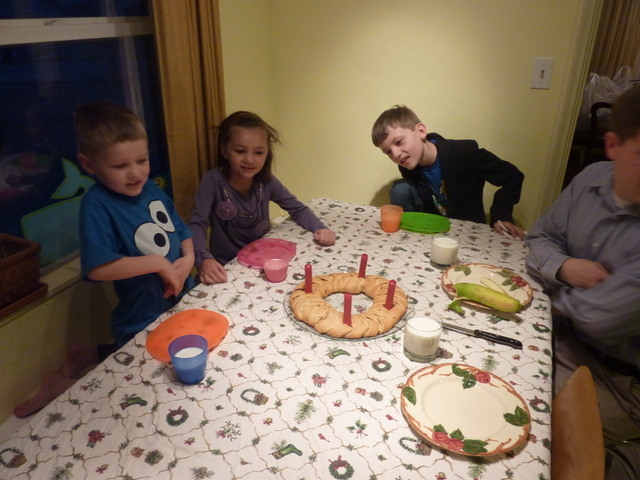 The traditional way of observing St. Lucia’s Day is to have the oldest girl in the family (or the most popular girl in the village) get up early on Dec. 13th, put on a white dress and a candle-wreath-crown, and bring breakfast in bed to everyone else. Option Two is simply to EAT a candle-wreath-crown. 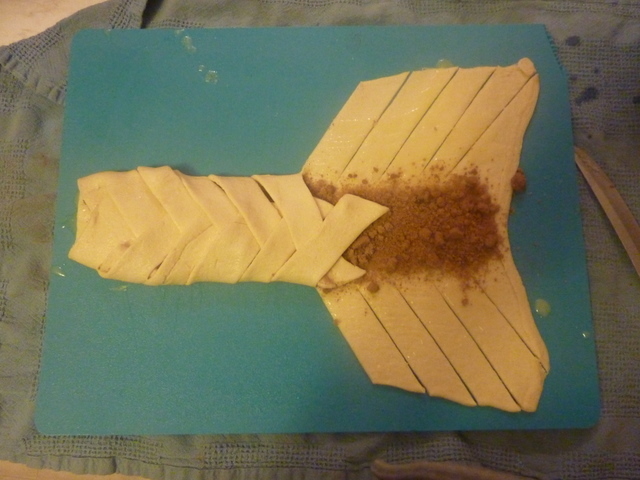 One made of pastry, of course. 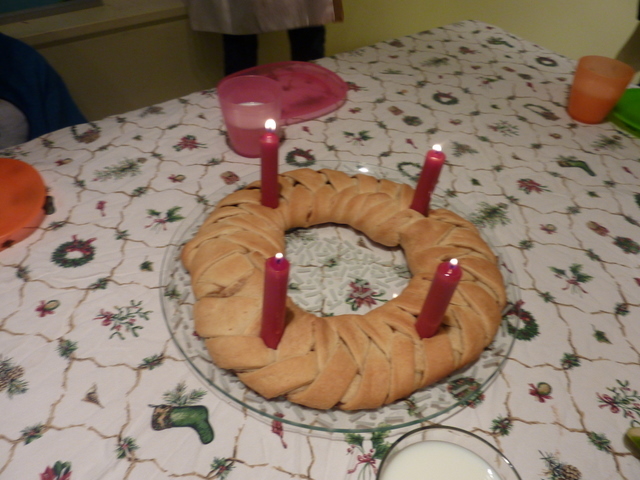 I’ve wanted to obeserve St. Lucia’s Day for years (hey, I like pastry, and with Brian’s Scandinavian ancestry, it feels legit) but it’s only been until today that I’ve found a candle-wreath-crown recipe easy enough to pull off on a weekday morning. This is mainly thanks to the cans of Pillsbury “full sheets” of crescent roll dough I’ve recently found in stores. It contains one big giant rectangle of dough that you can transform into anything you want. Preheat the oven to 375. Line a baking sheet with parchment paper and coat with baking spray. In a small bowl, combine sugar and spices. De-tube or whatever a can of dough and roll it out. Brush butter down the center third of the dough and sprinkle half of the sugar-spice mixture on top, leaving the rest of the dough plain. 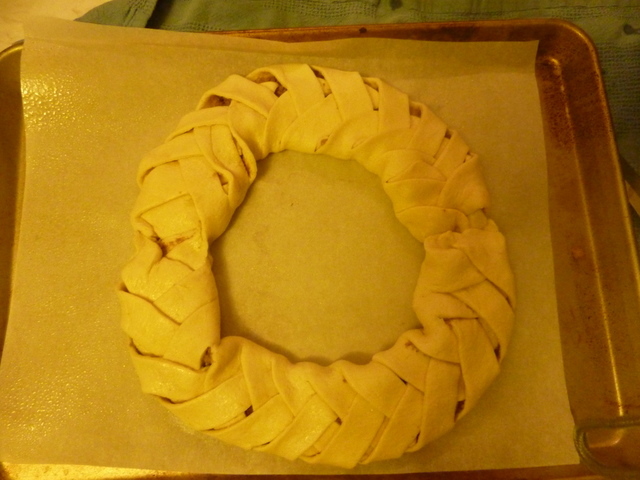 Repeat with the other tube of dough and remaining mixture, then form both braids into a wreath on the baking sheet. Bake for 20-25 minutes or until a nice golden color. I suppose the more proactive among you could form the wreath the night before, refrigerate it, and bake it off in the morning. If you do, it’ll probably take 30 minutes of baking time. The fancy-schmancy among you have probably already had the idea of putting on a butter, milk, or egg-wash glaze before baking and/or sprinkling it with white sugar. Good for you. You’re supposed to light candles in the wreath before you eat it. It looked pretty, but I didn’t have time to wait for the wreath to cool before I stuck the candles, in, and the bottoms melted a bit into the hot pastry. Silly me.